David Kramer and Bjorn Farrugia have a new listing at 621 15th Street, Santa Monica, California 90402. Situated on one of the most coveted streets North of Montana, nestled on 15th Street and close to the boutique stores on Montana Ave. stands this contemporary Zen paradise. Designed around the art of entertaining, this 3,081 SF home has been meticulously maintained by its current owner. Features included a formal living room with a cozy fireplace, large formal dining room and custom made Redwood wine cellar with separate alley access. Located on the ground level is an oversize master suite with a set of French doors that open to glorious outdoor space. His and hers closet and a spa like bathroom with a soaking tub, stand-alone shower and dual sinks. The chef’s kitchen is where it all happens. Recently updated with stainless steel high end Miele appliances, tons of cabinetry, a center island and a large eat-in area. A large set of glass French doors opens to a relaxing sitting area that overlooks the sparkling pool. The Perfect spot for entertaining all year long in the beautiful Santa Monica weather. The 2nd floor includes 3 bedrooms 2 baths and an intimate balcony, a great spot to gaze at the trees and enjoy the ocean breeze. This property is truly ideal for those wanting to experience living both near the beach and living in a thriving neighborhood. Not only is there value in your home with the average sale price per sq. ft. is $1,271, but the close proximity you are to Brentwood, Venice, and Pacific Palisades, are just some of the benefits of living in this part of Los Angeles. Check out the list below of our favorite places in and around Santa Monica. Third Street Promenade consists of car-free blocks that are anchored by the upscale Santa Monica Place. Downtown Santa Monica is both a shoppers and foodies paradise. The streets are aligned with your favorite stores and restaurants featuring cuisines from around the world. Whether you’re taking a break from the beach or wanting a fun night out, Third Street Promenade is the place to be. For those who enjoy working out outdoors this is the place for you. Two sets of stairs: wooden 170 steps, concrete 199 steps make this the ultimate calorie burner without a gym membership needed. When you think of Santa Monica, you instantly think of the iconic Santa Monica Pier. The pier features an amusement park along with restaurants and events held throughout the year such as the Twilight Concert Series held in the early fall. After exploring the pier jump into the Santa Monica Ocean or take a walk on the beach. 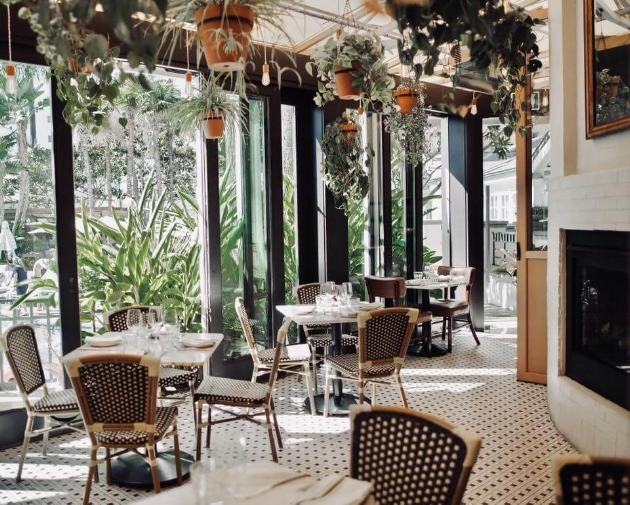 Experience this farm-to-table Mediterranean-influenced bistro for breakfast, brunch, lunch, or dinner located in the Fairmont Hotel. Dishes include wood-fired pizza to bold flavored salads, to refreshing cocktails. Not to mention the casual setting looking out to the wonderful landscaping and pool of the hotel. Do not forget to check out their “FIG AT FIVE” happy hour 7 nights of the week which includes half off of most of their menu from 5-6pm. Be sure to check out our listing during our next open house Tuesday, September 25th, from 11AM - 2PM!